Well, yesterday was both good and bad for bears. It was a great day for anyone who was trading the charts on a short-term basis, as the near-term preferred count had been anticipating a break below 2437 and the SPX cash market opened way down at 2428. This made for an easy 22+ points of profit for anyone who sold the 2450-54 target zone and closed in the downside target zone (which, for cash traders, would have entailed taking at least partial profits directly upon the cash open). But the market quickly recovered, so the day ended up being a disappointment for any bears who were holding out hope for more follow-through. This behavior forces bears to be a bit cautious going forward, because that type of price action suggests a lot of buyers were waiting in the wings (more on this later). So if SPX sustains a breakout over next resistance (2455ish), then bears will have to behave even more cautiously, especially until the next target is reached, and/or until the market gives signs of reversing. That said, there is still a chance that 2455 resistance will hold and that yesterday was a "one off" for bulls. The upcoming sessions will answer that directly. BKX is worth another look here, because it's indicating that it's reached an inflection point, but also indicating that if this inflection point fails, it is likely to fail significantly. 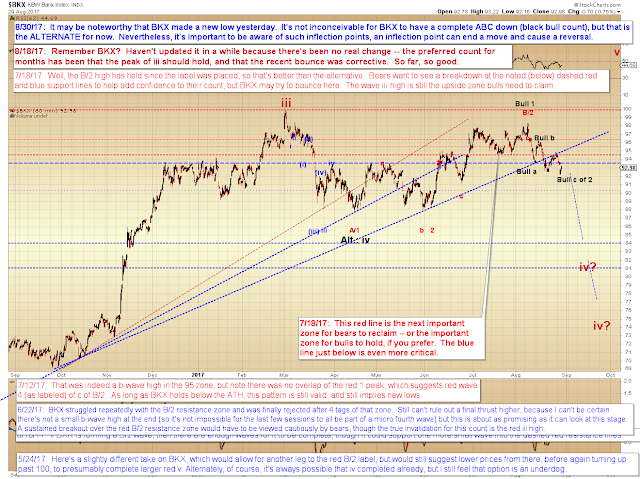 The preferred count remains bearish for now. 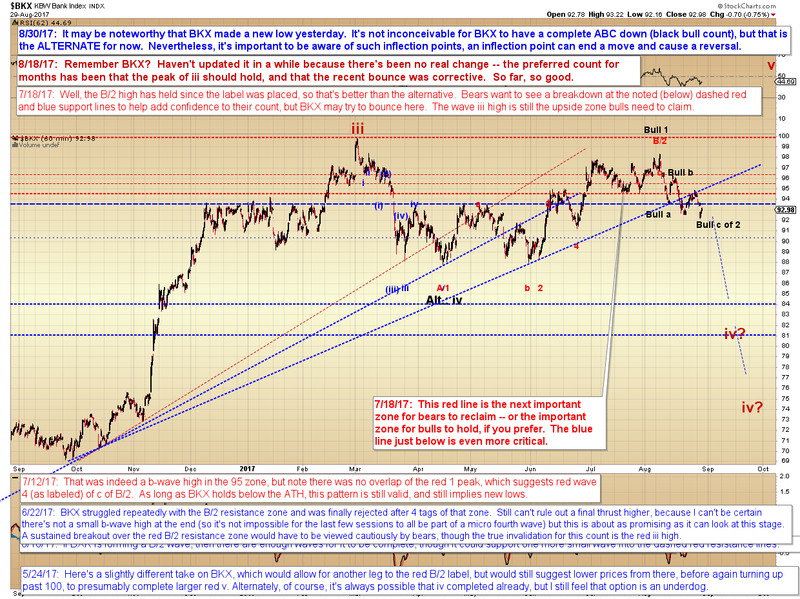 In conclusion, yesterday indicated lots of buyers were waiting for lower prices, and sometimes that's quite bullish. But there are also times when buyers trip over themselves for a day, only to find that everyone who wanted to buy got in on that same day, and there are not enough buyers left after that. As noted, the upcoming sessions are going to tell us which instance this was. 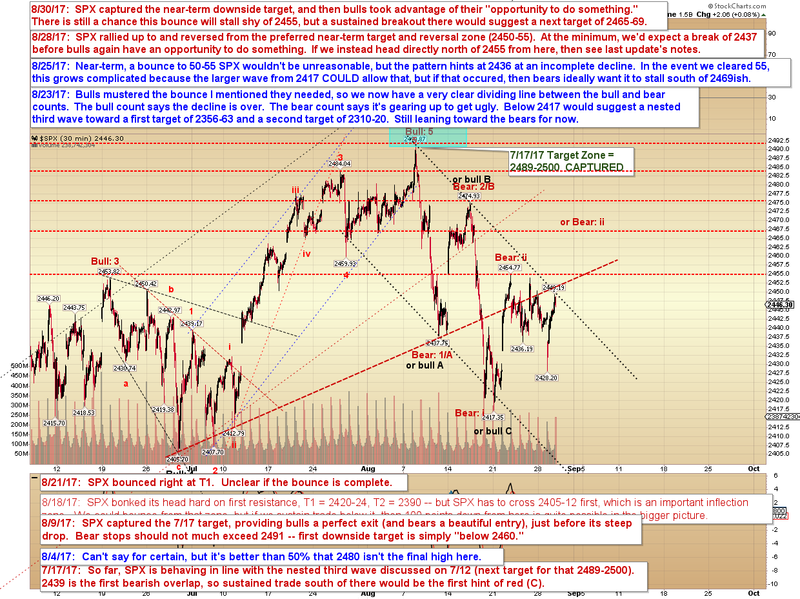 For the moment, I'm still leaning bearish on the bigger picture. Trade safe.